Yesterday was all-out Wonder Woman 1984, whereas everything is focused on her cousin, Aquaman. We received quite a surprise earlier today as Entertainment Weekly revealed just a small bit of their upcoming cover spread on DC’s upcoming underrated adventure. Get your first look at James Wan’s first superhero blockbuster below! Jason Momoa first showed up as the half-human, half-atlantean in 2016’s Batman v Superman: Dawn Justice, where his role was expanded but still held back a bit in last year’s Justice League. Now with the DCEU in flux, Momoa is finally getting his chance to shine as the titular character this December in the character’s first ever solo movie. While it’s not considered an origin movie, the character of Arthur Curry still has a long way to travel until he reaches his destiny as King, and James Wan looks to bring all that to screen in his first turn as comic book director. The adventure will include some of Aquaman’s biggest friends and foes, and thanks to EW, we now have our first official look at a few them. While Amber Heard did first appear as Mera in Justice League, these first look images is our first real glimpse at the character in turn form, meaning her red hair. If you’re thinking that her locks might be too bright, don’t worry, post-production effects will change that up for us. Alongside Mera we get our first official look at Aquaman’s brother King Orm (Patrick Wilson), Black Manta (Yahya Abdul-Mateen II), Vulka (Willem Dafoe) and Nicole Kidman as Queen Atlanna. Honestly, I’m all for this. Yes, Warner Bros. has heavily struggled with their DC properties, and pretty much put the universe into a can. But after how awesome he was in Justice League and with James Wan in the director’s chair, I’m hoping at the highest of levels that this movie can be just as good and fun as Wonder Woman was. At this point, I don’t care about a shared universe, just give me good storytelling for characters who deserve it. What do you think of these first look images? 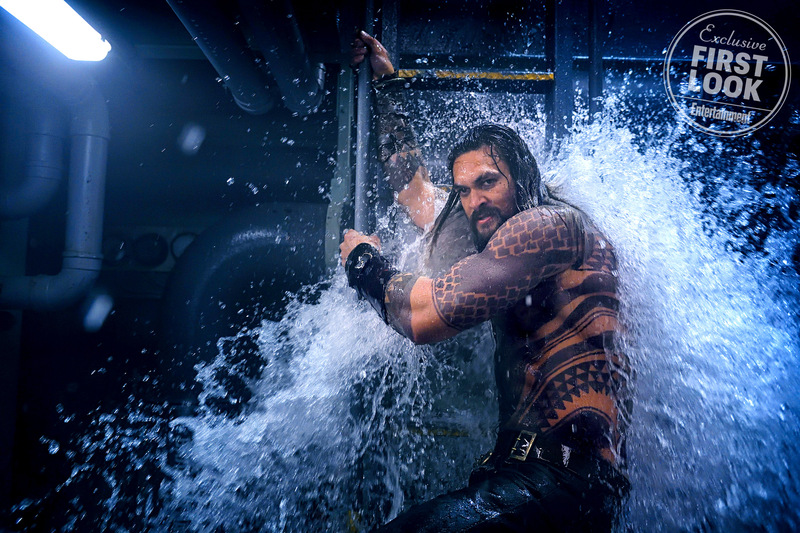 Which characters, outside of of Momoa, are you looking forward to seeing the most? Is there anything that makes you nervous? When do you think we’ll see a first trailer? Also starring ADolph Lundgren and Randall Park, Wan’s Aquaman washes up in theaters on December 21st.